Heat oil in a pan, add mustard seeds and cumin seeds. Once splutter add ginger garlic paste and cook for 2 minutes. Add onion cook till it translucent. Add tomato, chilli powder,coriander powder and turmeric powder ,cook until raw smells goes. Add 1/2 cup of water and let it boil. Mean while in a separate pan cook take mushroom for 2-3 minutes. Once the gravy boils add mushroom, coconut/cashew paste and cook till mushroom get done. 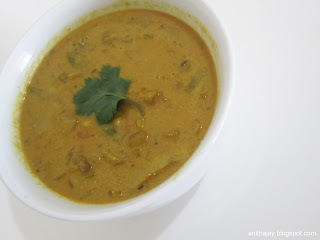 Serve hot with Rice or chappathi. I can have this curry with some rotis for my dinner tonite.